Hey there! Thanks for dropping by what goes around comes back around! Take a look around and grab the RSS feed to stay updated. See you around! 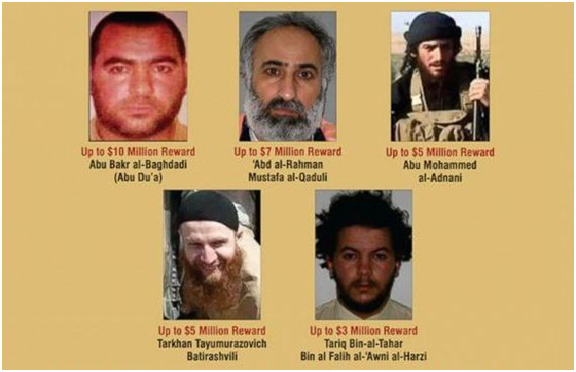 US has posted a $20 million bounty for information on leaders of the Islamic State group. The State Department announced that it seeks information that can lead to the arrest of Abd Alrahman Mustafa alqaduli, Abu Mohammed Aladnani, Tarkhan Tayumurazovich Batirashvili and Tariq Ben Altahar alfalih Alawni Alharzi. Alqaduli, the deputy to Al Qaeda leader in Iraq Abu Musaab Alzarqawi. He joined IS following his release from prison in early 2012. Aladnani,is the official spokesman of Islamic State group. Batirashvili is a senior commander in the group. Alharzi is a leader responsible for the borders between Syria and Turkey and a chief of the suicide bombers. The State Department said Islamic state is an international terrorist group that recruiting members from around the world And commit what described as a gross and systematic human rights violations . The US offered earlier a $10 million bounty for the Islamic state leader Abu Bakr AlBaghdadi. قالت تقارير أن رجل الدين السعودي والمفتي عبد العزيز آل الشيخ أصدر فتوى مثيرة للجدل جديد تسمح للزوج أن يأكل من لحم زوجته في الحالات القصوى المتعلقة بالجوع من أجل إنقاذ النفس . و قال : “يسمح أكل الرجل لجزء من زوجته فى حال ما أصابه جوع شديد، وخاف على نفسه من الهلاك، والأكل قد يشمل عضوا واحدا من جسدها، أو أكل الجسد أن بلغ الجوع مبلغا عظيما”. ووفقا لتقارير محلية، فإن المفتي الذي يعتبر أعلى شخصية دينية في المملكة العربية السعودية قال أن هذا العمل من شأنه أن يظهر طاعة الزوجة لزوجها وسوف يظهر رغبتها في أن يصير جسديهما جسدا واحدا . وقد جذبت هذه الفتوى المزعومة المجتمع السعودي وأثارت الجدل في وسائل الإعلام الاجتماعية. وقام مستخدمو تويتر بسرعة بالتعبير عن صدمتهم من الفتوى الغريبة التي تم نسبتها إلى المفتي . ومع ذلك، لم يكن هناك أي وجود لهذه الفتوى المدرجة على موقع المفتي بعد. ولكن هذه ليست المرة الأولى التي يصدر من مفتي السعودية فتوى مثيرة للجدل. حيث قال في وقت سابق ان جميع الكنائس في جميع أنحاء الشرق الأوسط يجب تدميرها. كما انه دعم أيضا زواج القاصرات دون سن الـ 15. كما ووصف سابقا موقع تويتر بمصدر كل الشرور . وفي وقت لاحق، نفى المفتي إصدار الفتوى في بيان نشر في وكالة الأنباء السعودية. قائلا “إن الفتوى الدينية زائفة خلقت من قبل أعداء الإسلام للتشهير به وللحفاظ على المشاحنات في مجتمع مشغول حول قضايا لا صلة لها بالموضوع بدلا من أن يقف موحدا خلف الحكام مهتدون”. وقال أن “ما نسب إليه من قول ما هو إلا من الأراجيف التي يهدف من خلالها الأعداء لإشغال المجتمع عن قضيتهم الأساسية في هذا الوقت، وهي التلاحم والوقوف خلف القيادة الرشيدة ضد محاولات النيل من تشتيت الأمه”. وأضاف أيضا : “ما نسب إلينا من فتوى مغلوطة ما هو إلا كذب وافتراء جملة وتفصيلا، ويأتي في سياق تشويهٍ صورة الإسلام الذي أعلى شأن الإنسان وكرمه دون استثناء رجلا كان أو امرأة، وحافظ على حقوقه في دينه ونفسه وعقله وعرضه”. و استشهد من القرآن بآية (يَا أَيُّهَا الَّذِينَ آَمَنُوا إِنْ جَاءَكُمْ فَاسِقٌ بِنَبَأٍ فَتَبَيَّنُوا أَنْ تُصِيبُوا قَوْمًا بِجَهَالَةٍ فَتُصْبِحُوا عَلَى مَا فَعَلْتُمْ نَادِمِينَ). وختم المفتي قائلا أنه يجب ” تكاتف المجتمع وتقوية عزيمته ضد العدو المشترك الذي يتربص بالأمة، وعدم الالتفات إلى الأكاذيب والأباطيل التي يروج لها من أجل زعزعة المجتمع وتشتيت أهداف، والنيل من بلادنا وبلاد المسلمين”. Reports said , that Saudi cleric and the Mufti Abdul Aziz Aal Al-Sheikh has issued a new controversial religious edict “fatwa” allowing a husband to eat from his wife flesh in extreme situations related to hunger in order to save himself. According to local reports, The Grand Mufti which is considered a highest religious figure in KSA said that this act would show the wife’s obedience to her husband and will show her desire for the couple to become one. The alleged fatwa has attracted the Saudi Society and made controversy in social media platforms. Twitter users quickly took to the network and express their shock at the strange fatwa attributed to the Grand Mufti. However, there has been no mention of such fatwa listed on the mufti’s website yet. 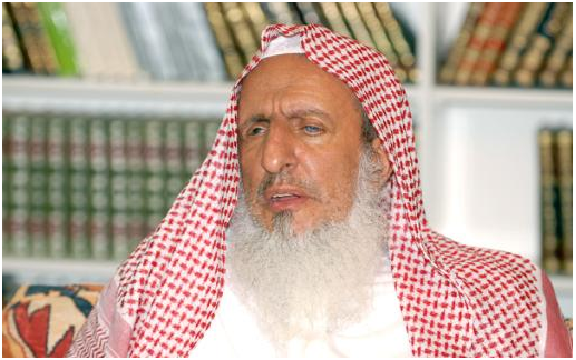 But this is not the first time the Saudi grand mufti issued a controversial fatwa. Previously, he said that all the churches across the Middle East should be destroyed. He also supported the marriage of minors under the age of 15. And described Twitter as the source of all evil. Later, The mufti has denied issuing the fatwa In a statement published in the Saudi Press Agency . He said that the religious edict was false and created by Islam’s enemies to slander him and “keep the community busy squabbling over irrelevant issues instead of standing united behind the rightly guided rulers”. He also added , “The fatwa attributed to us is wrong. It is nothing but lies .. It has been circulated to distort the image of Islam, which has elevated and granted a dignified status to men and women without exceptions”. The sheikhs ended by saying that Muslims should stay united against their enemy and ignore attempts aimed to undermining their commitment to protect themselves and their countries.